Slouching—with your shoulders and upper back rounded forward—can lead to aches and pains in your back, neck and shoulders. Headaches and tension in the shoulders and back are often created by chronic bad posture. If you’re slouching, you may also have gastrointestinal reflux or feel fatigued because you’re unable to breathe deeply. Slumping your shoulders doesn’t just make you resemble one of our long-extinct ancestors—if you don’t stand up straight, no amount of exercisewill give you the hot bod you’re after. 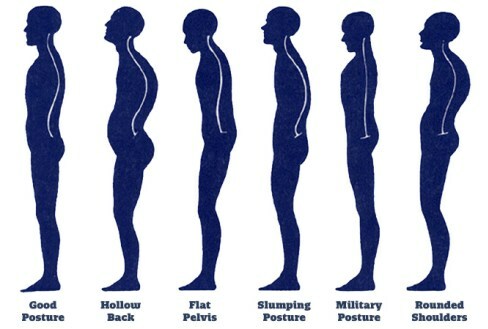 Over time, poor posture takes a serious toll on your spine, shoulders, hips, and knees. In fact, it can cause a cascade of structural flaws that lead to back and joint pain, reduced flexibility, and compromised muscles, all of which limit your ability to burn fat and build strength. But you can head off all these problems by taking the simple self-test to the right, then using the exercises below to fix your form, soothe your pain, and get your curves moving in the right direction. Stand with weight mostly on the balls of the feet, not with weight on the heels. Keep feet slightly apart, about shoulder-width. Let arms hang naturally down the sides of the body. Tuck the chin in a little to keep the head level. Be sure the head is square on top of the spine, not pushed out forward. Stand straight and tall, with shoulders upright. If standing for a long period of time, shift weight from one foot to the other, or rock from heels to toes. Stand against a wall with shoulders and bottom touching wall. In this position, the back of the head should also touch the wall – if it does not, the head is carried to far forward (anterior head carriage). Keep the head up and eyes looking straight ahead. Avoid pushing the head forward. Keep shoulders properly aligned with the rest of the body. Sit with the back firmly against the seat for proper back support. The seat should be a proper distance from the pedals and steering wheel to avoid leaning forward or reaching. The headrest should support the middle of the head to keep it upright. Tilt the headrest forward if possible to make sure that the head-to-headrest distance is not more than four inches. Sit all the way back in your chair. If you sit too far forward, there’s pressure placed on the pubic bone; too far back, there’s pressure on the tailbone. Find the middle range by keeping your feet flat and centering your weight with your buttocks and pubic bone creating a triangle. On bleachers, keep the triangle position in place, which will naturally align everything (stadium chairs don’t help much, so get up and move around every so often). In the car, it’s important to support your lower back to prevent pain. You can adjust the seat or use a small pillow behind your lower back. A lack of flexibility can lead to muscle imbalances and poor alignment. Include stretching in your weekly exercise program, and stretch daily to relieve specific points of discomfort. Try this super-easy stretch to relieve neck and shoulder stress: While standing or sitting, pull your head back, and center it over your spine. Pull your shoulders back and down, moving your arms as if you’re trying to put your elbows in your back pocket. Push palms outward—as if you’re inside a door frame—and hold for at least six seconds. Do this a few times during every hour you’re sitting at your computer. Lifting kids, luggage or groceries can really hurt your back if you don’t use proper posture. The most dangerous position is bending and twisting because there’s nothing supporting the spine. When you lift, stand directly in front of the object, not to the side. Place your feet slightly wider than your shoulders and squat from the knees, using the gluteal muscles to lift. Pull in your stomach, exhaling on exertion. To pick up small items, such as toys, bend at the waist, keeping your head and back straight while extending one leg off the floor straight behind you.